Babi Yar is a ravine near Kiev, capital of the Ukraine, which was part of the former USSR. On September 29-30, 1941, over 33,000 Jews were murdered there by SS Einzatsgruppe C, German Schutzpolizei and members of the Ukrainian police. Subsequently, more Jews, Roma, mental patients, Ukrainian nationalists, and Russian soldiers were murdered there. Perhaps 100,000 to 200,000 were killed in all. The Soviet government knew about the massacre as early as 1941, but found it convenient to ignore it and suppress the memory of Babi Yar until the 1960s, when Anatoli Kuznetzov was permitted to write a censored historical account, and the poet Yevgeyni Yevtushenko wrote the poem, Babi Yar. In 1976, the Soviet government belatedly erected a monument to the victims. However, this monument only mentioned that Soviet citizens. In 1991, the Ukrainian government allowed monuments that mentioned that Jews were killed. 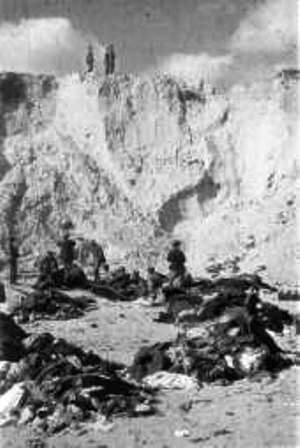 The massacre of Babi Yar is documented by photographs, the report of the SS Einzatsgruppe, witnesses and sworn testimony at the Nurenberg trials. Nonetheless there are publications and Web pages such as judicial-inc.biz/Babi_Yar.htm which insist that the massacre story was fabricated by Jews and Bolsheviks. Operation Barbarossa, the Nazi invasion of the USSR, began on June 22, 1941. Owing to the criminal unpreparedness of the Soviet forces, as well as eager cooperation of many Ukrainian nationalists promised independence by the Nazis, Wehrmacht forces advanced quickly in the first months of 1941, reaching Kiev on September 19. With them travelled several SS Einsatzgruppen (Special task forces) who were charged with the murder of Jews, Soviet Commissars and others who were "Bolshevized" were also to be murdered under the written Kommissarbefehl ("Commissar order") of June 6, 1941. The Kommissarbefehl was exceptional, because it was one of the rare times that Hitler was willing to sign a order that called for criminal behavior. Most of the Holocaust-related orders were relayed as "Fuhrer Befehl" by Himmler and other deputies. By definition, Nazis considered that all Jews were "Bolshevized." Therefore, the fate of the Jews was sealed, even without more explicit orders. As the Wehrmacht advanced, the SS Einsatzgruppen advanced with them, entering each city and murdering Jews and communist officials with the eager help of local collaborators, including Lithuanian, Latvian and Ukrainian SS and police units, as well as Poles as in the case of the Jedwabne Pogrom. As the SS Einzatsgruppen and their police auxiliaries only numbered a few thousand troops, it is obvious that they could never have accomplished the murder of 1.2 million people without the willing assistance of others - both Wehrmacht personnel and local anti-Semites. In each locale, groups of Jews were taken to a place outside the city and shot or gassed in special trucks. Therefore, the murder at Babi Yar was in no way a spontaneous response to partisan attacks and should not be understood as such. It was strikingly similar to massacres that had occurred elsewhere in the Ukraine and the Baltic. The uniqueness of Babi Yar lies only in the exceptional number of people murdered in a brief time -- it was the largest single massacre of its kind -- and in the unwillingness of the Soviet government to admit that Jews or other special groups had been targeted, or even to admit that the massacre had taken place for such a long time. When the Germans entered Kiev, about 100,000 Jews of the city's population of 160,000 Jews had fled. The remaining 60,000 were often those who were too ill or too old to travel. During the first days of Nazi occupation, buildings occupied by the Nazis blew up, owing to the work of NKVD commandos who had been left behind for this purpose. The Nazi command decided to use the sabotage as a pretext to carry out their liquidations of Jews. Maj. Gen. Friedrich Georg Eberhardt and SS-Obergruppenfuhrer Friedrich Jeckeln, the SS and Police Leader at Rear Headquarters Army Group South were put in charge. Einsatzgruppe C carried out the Babi Yar massacre and a number of other mass murders of Jews and others in Ukraine during the summer and fall of 1941. Its commander SS-Brigadefuhrer Dr. Otto Rasch and the officer commanding Sonderkommando 4a, SS-Standartenfuhrer Paul Blobel were at the September 26 meeting as well. The massacre was implemented primarily by Sonderkommando 4a, commanded by Blobel, under the general command of Friedrich Jeckeln. The personnel consisted of SD and SiPo (SicherheitsPolizei - Security Police), the third company of the Special Duties Waffen-SS battalion, a platoon of the 9th Police Battalion, Schutzpolizei (German "Protection Police") Battalions 45 and 305 and units of the Ukrainian auxiliary police. Though Schutzpolizei Battalion 45, commanded by Major Besser, conducted the massacre with the support of the SS, supported by a Waffen-SS battalion, the division of labor was not neat. Units of the Ukrainian auxiliary police rounded up and direct the Jews to the location, but the Ukrainians also participated in the massacre itself, and in burial of corpses. All Jews [in Russian, the pejorative slang term жиды - Zhidi "kikes"] of the city of Kiev and its neighborhood have to present themselves on Monday, September 29, 1941, by 8:00 AM at the corner of Melnіkov and Dokterivsky streets (near the cemetery). Bring your documents, money, valuables, warm clothes, linen etc. Any Jew who does not fulfill this order and is found elsewhere, will be shot. There were only two marksmen carrying out the executions. One of them was working at one end of the ravine, the other at the other end. I saw these marksmen stand on the layers of corpses and shoot one after the other. The moment one Jew had been killed, the marksman would walk across the bodies of the executed Jews to the next Jew, who had meanwhile lain down, and shoot him. It went on in this way uninterruptedly, with no distinction being made between men, women and children. The children were kept with their mothers and shot with them. I only saw this scene briefly. When I got to the bottom of the ravine I was so shocked by the terrible sight that I could not bear to look for long. In the hollow I saw that there were already three rows of bodies lined up over a distance of about sixty meters. How many layers of bodies there were on top of each other I could not see. I was so astonished and dazed by the sight of the twitching, blood-smeared bodies that I could not register properly the details. In addition to the two marksmen there was a "packer" at either entrance to the ravine. These "packers" were Schutzpolizisten, whose job it was to lay the victim on top of the other corpses so that all the marksman had to do as he passed was fire a shot. When the victims came along the paths to the ravine and at the last moment saw the terrible scene they cried out in terror. But at the very next moment they were being knocked over by the "packers" and made to lie down with the others. The next group of people could not see this terrible scene because it took place round a corner. Most people put up a fight when they had to undress and there was a lot of screaming and shouting. The Ukrainians did not take any notice. They just drove them down as quickly as possible into the ravine through the entrances. The report also mentions murder of communists and Jews in other communities. Significantly, there is no mention in the report of any sabotage attacks that triggered these actions. The massacres were evidently part of standing orders that were not related to acts of sabotage that may have been used to vindicate them, and there was no need to explain the reasons for the massacres to SS command. In subsequent months, the Nazis murdered Roma people at Babi Yar, as well as additional Jews. Thousands of additional Jews were arrested, taken to Babi Yar, and shot. Some Ukrainians helped Jews go into hiding, but a significant number informed on them to the Germans. After the war, the officer in charge of the SiPo and SD (Siecherheitsdienst - Security Service) bureau testified that his Kiev office got letters 'by the bushel' from the Ukrainian population informing on Jews, so that the office lacked manpower to deal with them all. The Nazis also executed a few dozen Ukrainian priests, the former mayor of Kiev and Ukrainian artists and writers, as well as Russians. Notably, they murdered about 621 Ukrainian fascist collaborators of the OUN (Organization of Ukrainian Nationalists). The OUN, which consisted of more moderate (OUN-M) and more virulent OUN-B (the partisans of Stephan Bandera and the soldiers of the Nachtigall organized by the Nazis) had originally collaborated with the Nazis in undermining Polish and Russian authority and in murdering Jews and stealing their property. However, the Nazis eventually turned against them because the Nazi administrators were unwilling to make good on Nazi promises of independence for the Ukraine. Near Babi Yar, the Nazis created a prisoner of war or concentration camp - Syretsk. By the summer of 1943, it was evident that the Red Army would overwhelm the Wehrmacht as the Nazi eastern front collapsed under the Soviet assault. SS-Standartenfuhrer Paul Blobel came back to Kiev.In coordination with SS-Gruppenfuhrer Dr. Max Thomas, the officer commanding the SD and Sipo in the Ukraine, Blobel undertook to eradicate the evidence of the crime at Babi Yar. Blobel formed two special groups, Unit 1005-A was made up of eight to ten SD men and thirty German policemen, and was under the command of SS-Obersturmbannfuhrer Baumann. 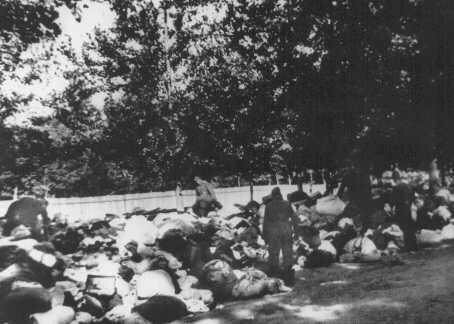 From mid-August the unit supervised the exhumation of corpses in Babi Yar and cremating them. The corpses were disentangled with a special tool, and 327 inmates of Syretsk were given the job of cremating them. The prisoners were housed in a bunker carved out of the ravine wall; it had an iron gate that was locked during the night and was watched by a guard with a machine gun. They had chains bolted to their legs, and those who fell ill or lagged behind were shot on the spot. The mass graves were opened up by bulldozers, and it was the prisoners' job to drag the corpses to cremation pyres, which consisted of wooden logs doused in gasoline on a base of railroad ties. The bones that did not respond to incineration were crushed, for which purpose the Nazis brought in tombstones from the Jewish cemetery. The ashes were sifted to retrieve any gold or silver they might have contained. Cremation began on August 18 and went on for six weeks, ending on September 19, 1943. On the morning of September 29, the prisoners learned that they were about to be put to death. They began a revolt that may have been planned in advance.. Shortly after midnight, under cover of darkness and the fog that enveloped the ravine, they began a revolt. Twenty-five prisoners broke out. Fifteen succeeded in making their escape. The Germans shot the remainder - over 300 prisoners - when they regained control of the camp. Beginning in late 1943, the Soviet government attempted to cover up the fact that the massacres at Babi Yar targeted mainly Jews. "The Hitlerite bandits committed mass murder of the Jewish population. They announced that on September 29, 1941, all the Jews were required to arrive at the corner of Melnikov and Dokterev streets and bring their documents, money and valuables. The butchers marched them to Babi Yar, took away their belongings, then shot them." "The Hitlerite bandits brought thousands of citizens to the corner of Melnikov and Dokterev streets. The butchers marched them to Babi Yar, took away their belongings, then shot them." Given the strenuous Soviet attempts to cover up the massacre of Jews until the late 1960s, claims of Holocaust "revisionists" that the massacre was a Jewish Bolshevik fabrication are absurd. It is important to emphasize that there is extensive documentation of the Babi Yar massacre, including confessions, photographs, copies of orders and testimony of survivors. Therefore, attempts to conceal the massacre or to deny it are not matters of legitimate historical debate or academic research, but rather vicious anti-Semitic propaganda. 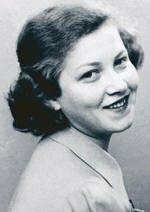 A Ukrainian Jewish actress, Dina Pronicheva, escaped by "playing dead" and then crawling out of the ravine, She told her story to Anatoli Kuznetsov in 1941 and testified at the Nurenberg trials in 1946. A very few others also managed to survive the massacre. Even while Nikita Krushchev was pretending to "reform" the "excesses" of Stalinism, the Soviet authorities were still intent on carrying out anti-Semitic policies. It was decided to fill in the site of Babi Yar and make a public park with no memorial there. This aroused the conscience of Soviet intellectuals, most notably Yevgeni Yevtushenko. Yevtushenko write a poem, Babi Yar, that he recited for the first time in a public meeting of about 1,500 people on September 16, 1961. Such public readings of poetry were very common in USSR, and Yevtushenko had a dramatic and effective presentation style that conveys emotional content in a way that could not be duplicated by the printed word. Inspired by Yevtushenko's poem, Dmitry Shostakovich wrote Symphony #13, Babi Yar. The poem and the symphony infuriated the Soviet communist establishment, which was in the midst of a racist campaign against "Zionism." The poem was bitterly denounced in the Moscow journal Literature and Life by the writer Dimitri Starikov who described it as an attack on "Lenin's policy of nationalities by means of ... acts of provocation". Starikov described Babi Yar as a "monstrous" insult to the Soviet people and warned Yevtushenko against falling deeper into a "foul swampy quagmire". Alexei Markov, questioned Yevtushenko's patriotism insisting the poet had defiled "Russian crew cut lads" who had died in battle against the Nazis. In 1963, the journal Sovetskaya Belorussia demanded that Babi Yar be rewritten because "it seeks to artificially revive the so-called Jewish problem and to start a discussion born in the old class society but which has already been solved and has died a natural death". The steep hillside like a rough gravestone. Today I am as old as all the Jewish people. Even today I bear the scars of nails. I think also of Dreyfus. I am he. The Philistine my judge and my accuser. ringed round, spat on, slandered. I am also a boy in Byelostok. "Beat the Yids. Save Russia!" the corn chandler beats up my mother. My need is that we look at each other. separated from the leaves, denied the sky. embrace each other in a dark room. They�re coming. Be not afraid. It is coming this way. Come then to me. Quickly, give me your lips. They're battering down the door. It's the roar of the ice. The trees look ominous, like judges. I feel myself turning gray. above the many thousand buried here. I am each old man shot dead. I am every child shot dead. Oh my Russian people, I know you. Your nature is the "Internationale." Foul hands rattle your clean name. I know the goodness of my country. Society of the Russian People. No part of me can ever forget it. hate me now as a Jew. I am a true Russian! Soviet authorities allowed the publication of a highly censored account of the Babi Yar massacre by Anatoli Kuznetzov in 1966 Kuznetzov later escaped to the West and and his full documentation was published in 1966.